Rotator Cuff Strengthening Exercises for a strong shoulder area. Improve this critical area for strong rotator cuffmuscles, injury prevention and a pain free fitness and athletic training. If you have been doing upper body exercises like the shoulder press, lateral raises and bench press with free weights like barbells and dumbbells which provide free range of motion, you need not do extra rotator cuff work in first 2 years of training. 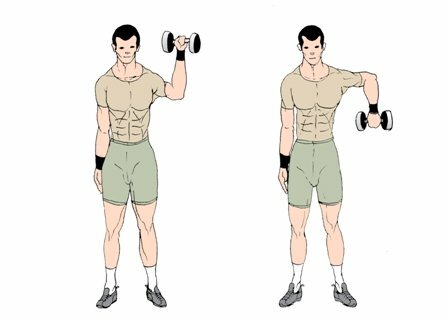 If you have been training with machines for upper body exercises or are an experienced lifts or in need to rotator cuff rehab, then these following rotator cuff exercises will be very helpful. Please read the disclaimer before proceeding.Also read the Rotator Cuff Treatment tips at the end of this page. 1. Identify the underdeveloped rotator cuff muscles. Shortening of subscapularis is diagnosed as the commonest cause of muscle imbalance. Underdeveloped Infraspinatus and teres minor muscles results in muscle weakness. 2. Cable exercises or tubing is the best way to strengthen rotator muscles as there is constant tension both at the beginning and end ranges of exercise. Dumbbells are a close second. 3. All rotator cuff workouts are best done at the end of the workouts or on a separate day when no other workouts are done. This is obvious as rotators being small muscles undergo fatigue faster. 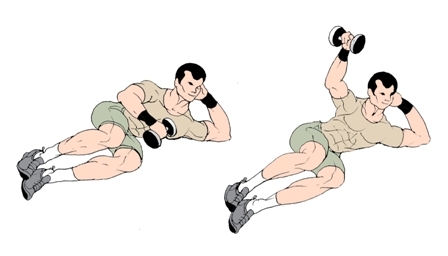 If done prior to bench press or overhead press, these fatigues muscles will affect the lifts..
1. Shoulder Internal Rotation Exercise - This Exercise helps strengthen the Subscapularis muscles. 2. Shoulder External Rotation Exercise - This exercises helps strengthen the Infraspinatus and Teres Minor Muscle. These exercises should not cause any pain as rotator cuff muscles are weaker than other shoulder muscles. Also a painful movement should indicate rotator cuff injury. Purpose - To strengthen the subscapularis muscles. This exercise is performed using a cable or exercise tube. 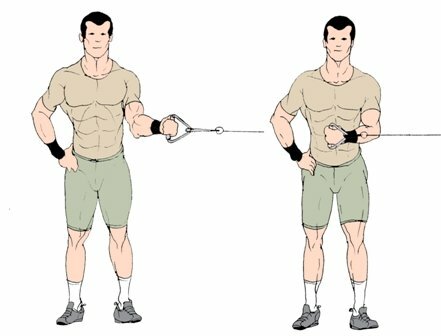 Attach one end of the cable pulley or tube to a straight bar and hold the grip/handle at mid-bicep curl position with your palms turned inwards. Now pull the arm across your abdomen making sure your elbow is fixed. A count of 15-25 reps is better as higher repetitions work best for the smaller rotator cuff muscles. Keep the shoulder joint fixed at all ties and do not rotate your shoulders. Purpose - To strengthen the Infraspinatus and Teres Minor muscle. This exercise is performed using a cable or tube and the initial set up is similar to internal rotation exercise. Now take the arm away from the body pulling it outwards. 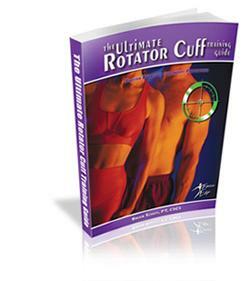 If you are serious about Rotator Cuff Strengthening then I highly suggest you read the Ultimate Rotator Cuff Training Guide by Brian Schiff, a Physical Therapist . Don't forget to download the Free Report on7 Tips to Immediately Reduce Rotator Cuff Pain. 1. The aim of tendinitis treatment is to decrease inflamation by using various modalities like anti-inflamatory medication. 2. A Period of rest from the causative activity is required. But the duration of rest is relative. Be in touch with your doctor regularly to see how fast you can get back to the gym or playing field. 4. During the period of rest its very critical that you maintain your lower body and trunk strength by engaging in weight training and cardiovascular fitness. Disclaimer - The information presented at ExerciseGoals.com is for informational purposes only and is not intended to diagnose or treat any medical or surgical condition and is NOT an alternative to medical care. Please visit your physician for help. Have A Rotator cuff exercise or workout tip or question? Do you have a great Rotator cuff exercise? Share it! 1. How can I tell if my rotator cuff is fully torn? A visit to your doctor is always best. If you are having a severe amount of pain when you do just about anything from shampooing your hair to pulling on a shirt, you have probably fully torn your rotator cuff. 2. Can a rotator cuff tear be repaired after years? Yes, your rotator cuff can heal. With proper precautions and pampering, you could see it heal in anywhere from as little as six months to as long as a couple of years. 3. Can a torn rotator cuff cause headaches? A torn rotator cuff can certainly cause headaches since it is a lot of pain that is taking place. Pain anywhere in the body can always lead to headaches. 4. What can you expect after rotator cuff surgery? You are going to be in a lot of pain and you will probably feel as though everything is starting to tighten up too much. Once you have the "go ahead" to start slowly working out again, you will want to start with five pound dumbbell weights in order to simply keep your muscles moving. 5. Where is the rotator cuff located? Your rotator cuff is located in the shoulder region and is composed of four muscles. Together, they help provide the shoulder some stability and they help to rotate the arm. 6. Can rotator cuff tear heal without surgery? Yes, the rotator cuff tear can heal without surgery. However, if you are not taking it easy, you may experience a very long recovery time or possibly no recover at all. 7. How long until I can golf after rotator cuff repair? Since golf requires a great amount of strength, it would be wise to give it at least six to eight weeks after the repair of your rotator cuff before you head out to the green. 8. Can I play golf with a torn rotator cuff? Technically, yes, but you will be in a ton of pain and your game will probably suffer. Because of there the rotator cuff is located, there is a chance that you could actually make the situation worse. 9. Any exercises when you have a strain in rotator cuff? If you are experiencing a strain in your rotator cuff, you will want to keep active so that your muscles do not tighten up, but of course, you want to take it easy as well. Use light weights and practice extending your range of motion, to the point where you can't anymore. 10. Can I continue to workout with a torn rotator cuff? Yes, you can continue to workout with a torn rotator cuff but you are most likely going to notice that there are a lot of exercises that you will not be able to do. 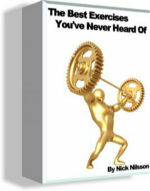 Go from Rotator Cuff Exercises and Workouts to Weight Training Homepage.